H+E designs & builds water and waste water treatment plants for industrial applications and complete waste-to-energy plants; core elements being designed and sourced within the Company.Water TreatmentUsing all available technologies, we supply pure water treatment systems for Power Generation, Electronics / Photovoltaic, Pharmaceutical, Petrochemical and other industrial applications.Wastewater TreatmentWe supply plants for most industries, and therefore have a very wide range of process technologies available. Since H+E has been in the business for more than 80 years, this is perhaps not surprising! A significant number of these treatment processes have been developed by us in response to the specific needs of our client. So, whether you discharge inorganic or organic wastewater, we are able to treat it reliably and have a very long Reference List of satisfied clients.ProductsWe also have a range of individual products that are available to you. One of these is the TOVEKO continuous gravity sand filter. This has a number of very significant operational advantages over other filter types.Whatever your specific needs are, we would be very happy to discuss them with you and to find an efficient and cost-effective solution. Please do contact us!Our wastewater recycling systems make the user less dependant on mains water supplies, & also reduce overall operating costs significantly. When your rate of chemical consumption is too high to use 25 litre drums but too small to consider bulk tanker deliveries, purchasing chemicals in 1m3 Intermediate Bulk Containers (IBCs) can be a good and economic choice. H+E's IBC Chemical Dosing Systems are pre-assembled prior to delivery and connect directly to the liquid outlet of the delivered IBCs. We are happy to supply just the IBC Chemical Dosing Systems if that is what you need, but we can also supply a complete system, or upgrade an existing one if you wish. We have very long experience in the design, supply and installation of water and wastewater treatment systems, and the whole range of chemical storage and dosing systems Whatever you need, please talk to us! IBC Chemical Dosing Systems 04/10/2017 15:08:00When your rate of chemical consumption is too high to use 25 litre drums but too small to consider bulk tanker deliveries, purchasing chemicals in 1m3 Intermediate Bulk Containers (IBCs) can be a good and economic choice. 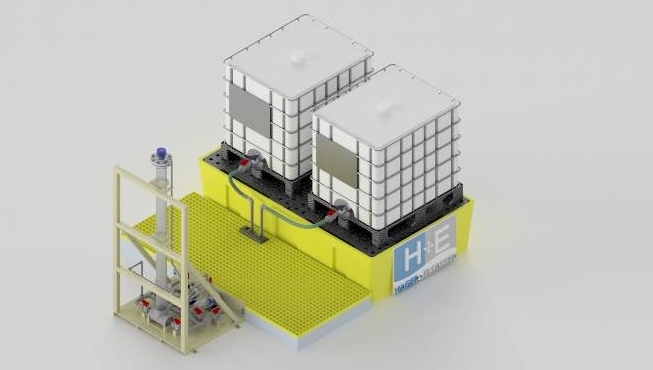 H+E's IBC Chemical Dosing Systems are pre-assembled prior to delivery and connect directly to the liquid outlet of the delivered IBCs.